Cancerous Mole or Not? Perform the ABCDE Test and Find Out! Home Health Cancerous Mole or Not? Perform the ABCDE Test and Find Out! The ABDCE test is a diagnostic test to know if you have a cancerous mole or not. In case of doubt, you should always consult your doctor. The ABCDE test is a technique used by dermatologists to study moles and skin lesions that are suspected of becoming skin cancer. According to a study by the National Cancer Corporation in 2014, skin cancer is the third most common type of cancer. The same study says that this disease affects mainly people with clear skin and ensures that in more than 90% of cases, the direct responsible is ultraviolet radiation. For this reason, preventive habits, such as polka-dot self-assessment and annual check-up, play a very important role in the fight against this type of cancer. Also, the study ensures that 90% of skin cancer cases detected early can be cured. 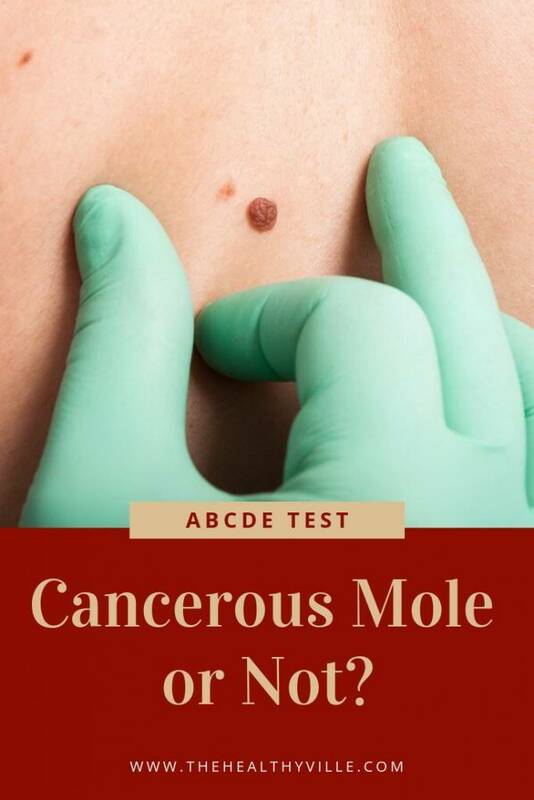 Therefore, the ABCDE test is an important diagnostic tool to discover whether you have a cancerous mole or not. Thanks to it, moles and spots are differentiated to prevent one of the most aggressive and dangerous types of skin cancer: melanoma. The ABCDE test: Cancerous mole or not? An early diagnosis of skin cancer ensures a very high survival in patients. Certain moles are more likely to become malignant melanomas. This is the case of the moles that we have since birth and that of the atypical moles, which are more likely to become malignant. The first letter tells us that we have to look at the shape of the moles. Those that are of a benign nature are those that are round and symmetrical, that is, when you could fold them, both halves would overlap. On the contrary, those of a malign nature tend to be asymmetric and without a concrete form. Irregular shapes or color changes may be indicative of skin cancer. The second aspect to evaluate is the regularity of the edges of the mole. This feature is another clue to know if it can be a malignant mole. When the edges are irregular, with jagged or sharp, wavy or ill-defined borders, the mole is likely to be malignant. The benign moles present the same hue throughout their pigmented area. However, if you find yourself before a spot that has a variety of color from one area to another (brown or black, and sometimes even white, red or blue) it is possible that you have a cancerous mole. Another important aspect to keep in mind is the size of the stain. If the diameter, which is the distance from one end of the shape to the other, is 6 mm or more, you’re probably facing a cancerous mole. The benign moles are small. A reference that we can use to measure moles is erasers that many pencils have on their end. It is a very visual way to check it, since the size of the rubber usually has a measurement of about 6 mm. Finally, the evolution of the mole must be considered. If it presents progressive changes in color and size or other spots appear around it, it is a clear sign that it could be a melanoma. This quick dermatological examination can be done by you as well as having an annual dermatological review to prevent any type of problem. In the case where you find an anomaly do not hesitate to go to the doctor. The prevention of skin cancer is to apply a sunscreen suitable for our skin type. The main prevention measure is the protection against solar radiation and artificial sources of UVA rays. It is important to highlight the importance of avoiding self-tanning UV cabins, as well as using a suitable sunscreen every day. Further info:Can A Mole Change Color And Not Be Cancer? Find Out All About Mole Changes! Do not expose yourself to the sun without photoprotection: you must use protection at least 30 SPF. Although 50 is more effective. Avoid sunbathing between 12 in the morning and 17 in the afternoon, especially in the hottest times of the year. If your children are under 3 years of age, never allow them to be exposed to the sun. Protect them with hats and photoresist adapted to your skin type. Don’t forget to SHARE how to test whether you have a cancerous mole or not with your friends and family on your social networks!